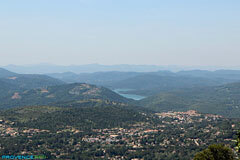 35 km from Nice and 6 km fromeGrasse. 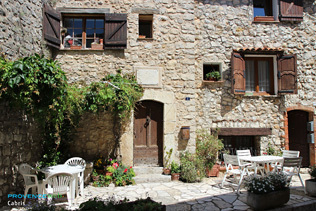 Cabris - which takes its name from the Latin word for goat "capra" - is one of those marvellous perched villages which only exist on the Riviera. 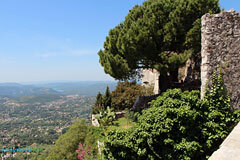 If you arrive from Grasse, you'll first see a large green meadow, with large trees, shady café terraces and pure air, which give this little Provencal paradise a particularly bucolic touch. All that remains of the medieval castle that overlooked the village are a few ruins and sections of the defensive wall. 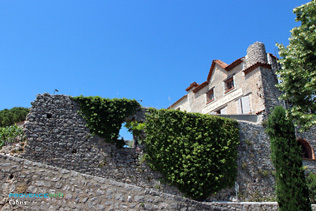 But from the castle square, you will be more than rewarded by the extraordinary view of the Mediterranean, taking in the Gulf of La Napoule, lthe Lerins islands, the foothills of Tanneron and the Saint-Cassien lake. 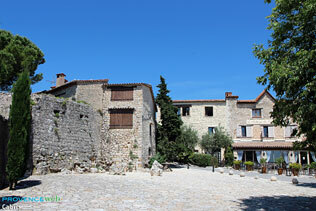 The village was devastated several times by war, at the time of Queen Jeanne in the 15th century and then during the Revolution, but has kept its charm. You will be delighted to stroll along its narrow streets and stairways lined with old grey stone houses, between succulents and fragrant lavender bushes, proud cypresses and even a few palm trees. Cabris has often attracted writers, such as Antoine de Saint-Exupéry who spent his childhoold holidays here in the early 20th century, Albert Camus who spent time here on several occasions during the 1950s, and André Gide who stayed here on returning from his journey to Egypt in 1940. 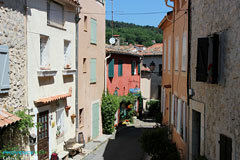 This is no doubt why Cabris is also home to the Vienot foundation, which focuses on the work of writers. 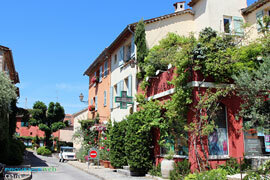 Cabris is a chic but lively village of artists: landscape gardeners, crafts artisans working with olive tree wood, creators of stained glass windows, and Provencal santon-makers. Lovers of natural curiosities who are not claustrophobic must visit the Audides caves; a network some 2 kilometres in length 60 metres underground, to admire the stalactites and stalagmites as well as an underground waterway. A nearby prehistoric amusement park exhibits flint artefacts and provides a realistic reconstitution of some prehistoric scenes: as if you were actually there ! Church St Roch, 17th century. 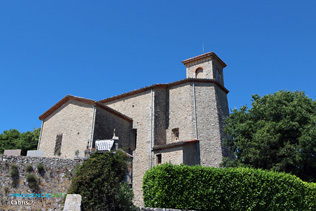 Chapel Ste Marguerite, 16th century. ChÃ¢teau Lobavov, 19 th century. Prehistoric remains at Croix de Cabris. The Audides caves (on the D4 road heading to Saint-Vallier-de-Thiey). St. Jean Fires (June). Live Nativity 24 December. 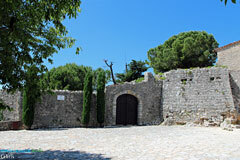 Provencale fair an tribute to Antoine St. Exupery (July). 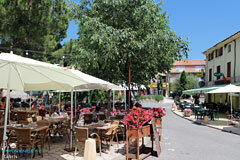 Village fair St. Roch (15th and 16th August). 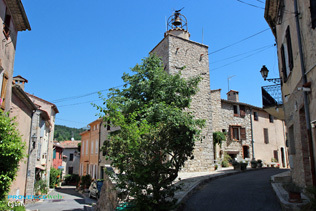 Speracedes (3km), Saint Vallier de Thiey (8km), Peymeinade (6km).